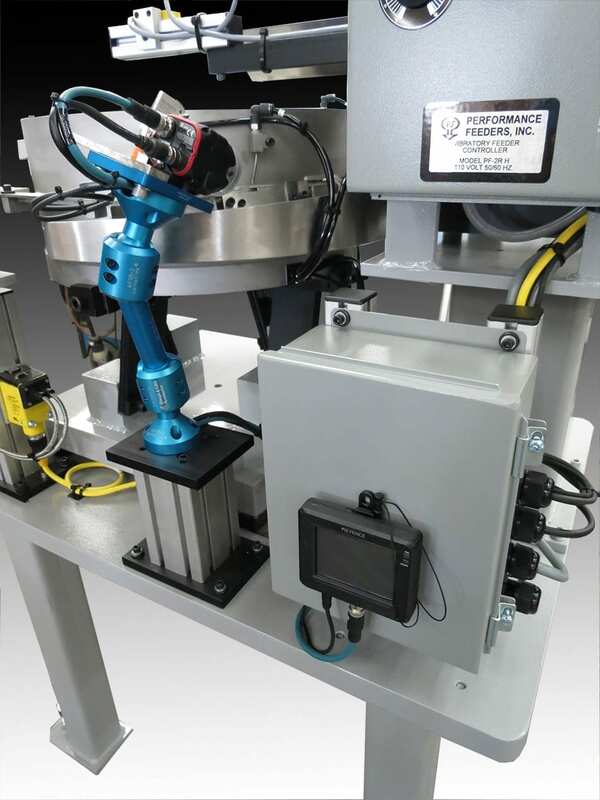 This application required feeding 3 different lengths of a small steel shaft into a centerless grinding machine. The diameter of one end of the shafts was slightly smaller than the other end, and the shafts needed to be oriented end-to-end with the small end leading. The parts were oriented end-to-end as they exited the bowl wall. In this area we were able to mechanically orient most of the parts with the small end leading. Parts that exited the bowl with the large end leading dropped onto the lower line, flipping over in the process, then the properly oriented lines of parts were merged back together for final inspection. We included a vision system to inspect each oriented part prior to discharge in order to ensure 100% accurate orientation. A proximity sensor detected a part in place, signaling the camera to take a picture of the part. If a backward part was detected, the PLC that controlled the vision system activated an air jet which blew the part off the track and back into the bowl feeder for recirculation. The PLC that controlled the vision system was mounted in the lower junction box, with the camera’s monitor mounted on the front. 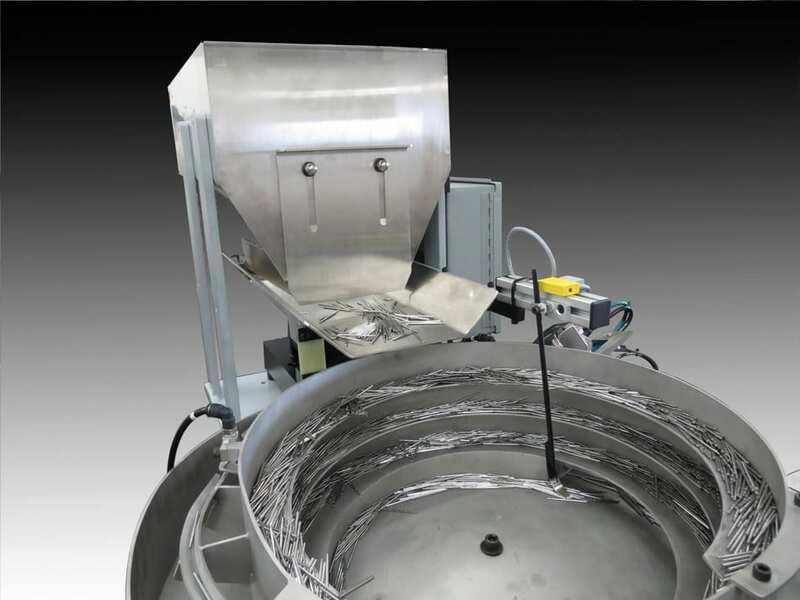 The bowl discharged the oriented parts onto an Auto-Kinetics belt conveyor which moved the parts into our customer’s centerless grinding machine. 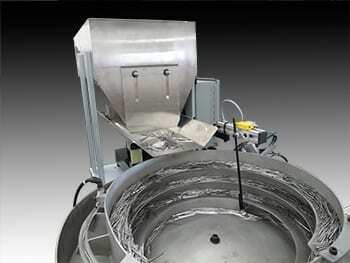 The system included a vibratory supply hopper with 2 cu. ft. of bulk part storage capacity and automatic metering of parts into the bowl feeder. 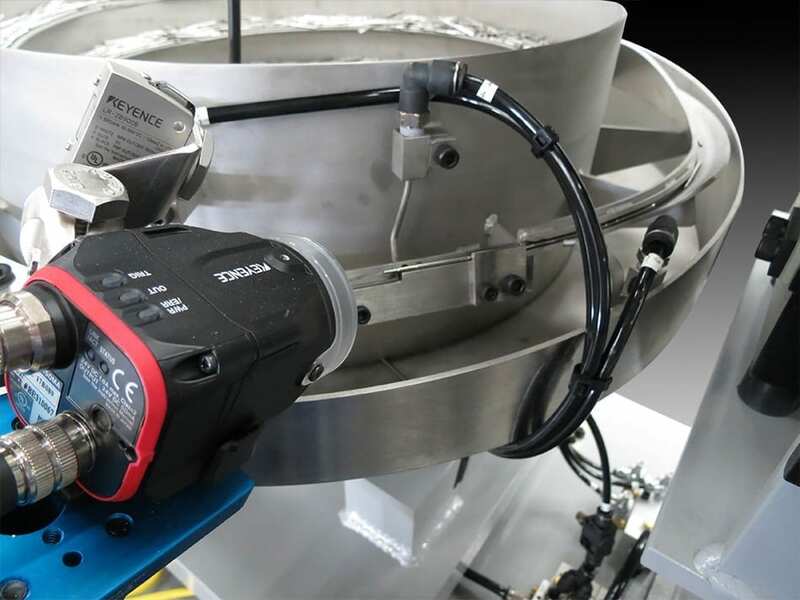 View this short video that demonstrates the vision inspection of the parts as they pass through the vibratory feeder bowl. 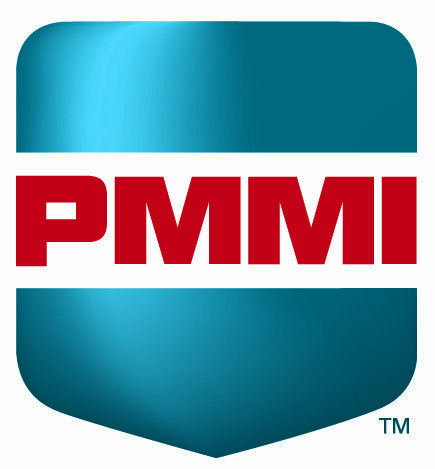 Mis-oriented parts are detected by the vision system which activates the PLC to blow them back into the feeder bowl for recirculation. Correctly oriented parts exit the feeder bowl onto a belt conveyor system and into the next step of the fully automated assembly process. Feed rate: 30 parts per minute. Auto-Kinetics Model 55 standard duty belt conveyor, 40mm wide x 35″ long. Reverse mounted 1/8 HP 130V DC motor. Table mount stands with locating pins so conveyor could be removed and replaced accurately. 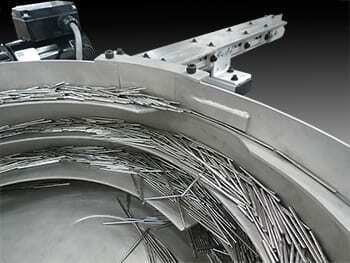 This allowed the customer to remove the conveyor to change the grinding wheel in their machine. Stainless steel bin and tray. Vision system: Keyence camera with proximity sensor and PLC. 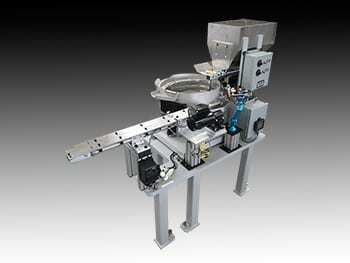 Performance Feeders PF-2R for bowl feeder and hopper. Mounting surface: 1.25″ thick steel plate with 5 legs and leveling screws. 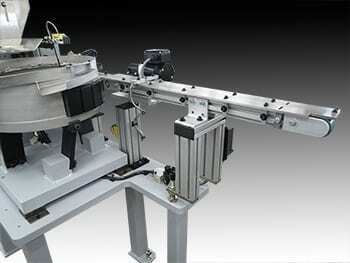 Photoelectric sensor on conveyor monitoring part level in conveyor. 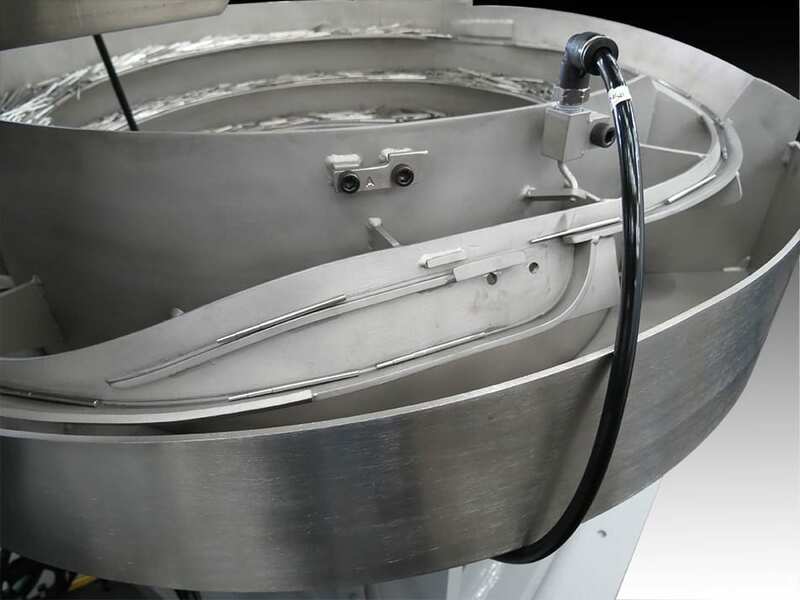 When conveyor is full, the bowl is turned off to prevent parts from backing up into the bowl. Proximity sensor on bowl feeder in camera area, sensing part in place for vision inspection.